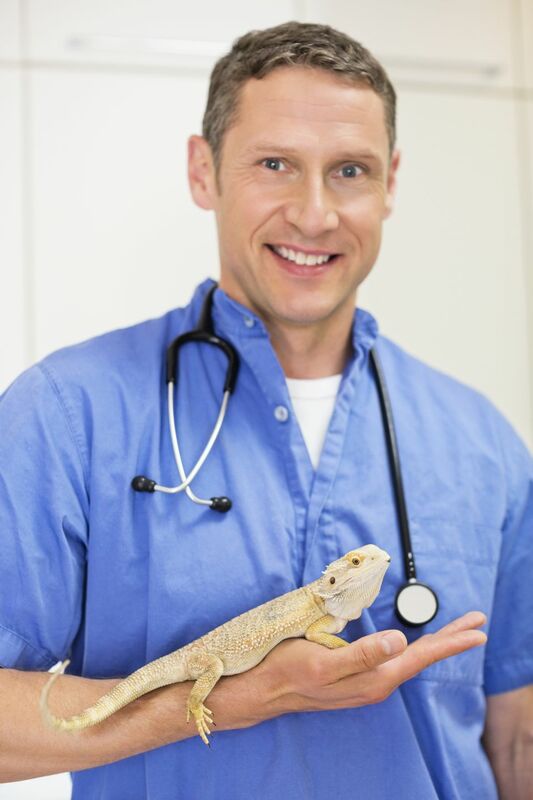 Establishing a good working relationship with a veterinarian can be a challenge for any pet owner, especially if they have an exotic pet. The exotic pet owner must find a veterinarian who is willing to see their pet, knows something about their pet, and has the facilities, equipment, and materials to treat their pet. Who Will Treat Exotic Pets? An interest in exotics doesn't necessarily equal proficiency in treating them. Many veterinarians are experienced in treating cats and dogs and enjoy working with exotic pets but have not spent much time treating them as they have other animals. Some veterinarians will be willing to provide routine and preventative care to some exotic pets (especially pocket pets) but will refer owners to a specialist if a medical concern arises. Most veterinarians and their technicians have very limited, if any, training with exotic pets in college. Therefore most of the education they have received on treating birds, reptiles, pocket pets, and other exotics is due to the continuing education and internships they have completed after their schooling. If at all possible, try to locate a vet who specializes in exotics. This means they have completed specialized training above and beyond what other veterinarians have done as well as other rigorous qualifications. Such specialists can be hard to come by so the next best vet is someone who has lots of experience treating exotic pets. When looking for a veterinarian, ask them about their training, credentials, and memberships in specialty organizations such as the Association of Avian Veterinarians (AAV), Association of Exotic Mammal Veterinarians (AEMV), or the Association of Reptile and Amphibian Veterinarians (ARAV). At the very least, choose a veterinarian with a real interest in exotic species who is willing to learn more about them and who will consult with a specialist when needed. A personal recommendation is probably the most efficient way of finding a veterinarian. Friends, breeders, or organizations (such as the local herpetological society or species specific rescue groups) are good starting points. The websites for the aforementioned professional organizations also list the veterinarians that are members to see where they work. Most importantly, do not wait until an emergency occurs to find a vet. If your pet should get sick, a veterinarian with whom you feel comfortable and who is comfortable dealing with your pet will make the situation less stressful for all parties. An initial check up is well advised for any new pet and this is a good chance to meet the veterinarian and ask questions. You can also see how they handle your pet, how comfortable they are with your pet, and see if you and the veterinarian make a good match - sometimes there is a personality clash and you won't develop a good rapport with a certain veterinarian. A veterinarian familiar with exotics will spend a good deal of time discussing the care and husbandry of a particular pet, as many problems with exotic pets are related to improper diet or husbandry. The veterinarian should also appear confident handling your pet. Having one primary veterinarian and one or two back up vets (in case someone is out of the office or closed when you need them) is ideal. Hopefully you'll never have to see your new exotics vet for anything other than a routine check up but knowing where you need to go if your pet has an emergency is priceless.